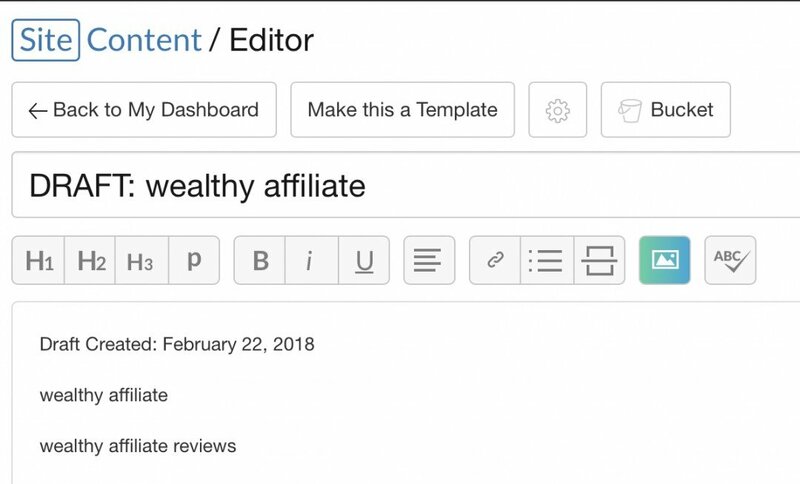 Today I wanted to give you a quick update about Jaaxy and the progress we've made with integrating it into the Wealthy Affiliate platform as the Official keyword tool! If you click on the Jaaxy menu on the left you will see that we now have a more elaborate menu with many more options than before. 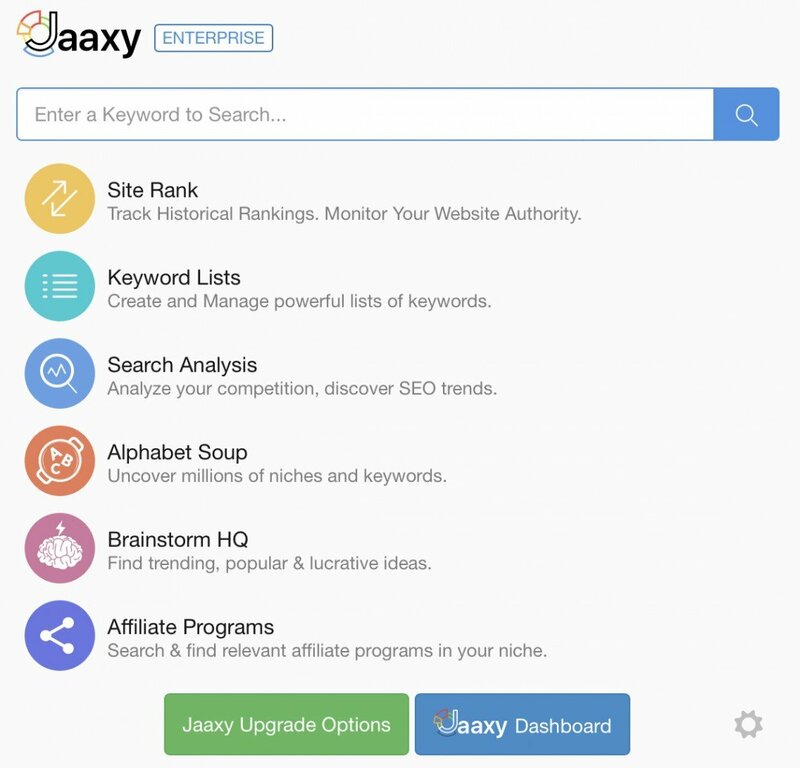 You now have options to open up the SiteRank tool Search Analysis, Alphabet Soup, Brainstorm HQ, and the Affiliate Program Search directly in the Jaaxy APP. This means one-touch access to these wonderful tools that you will have access to if you are a LITE, PRO, or ENTERPRISE member. We think that this will really make your Research a lot easier moving forward and we have plans to continue to build these elements into the interface right here at WA! Stay tuned for more updates in respect to that. Keyword Lists are Now Built into WA! The Keyword List platform within Jaaxy has been built directly into the interface here at WA. Click on "Keyword Lists" form the new Jaaxy menu and you'll be taken to your familiar Jaaxy KW list management area. 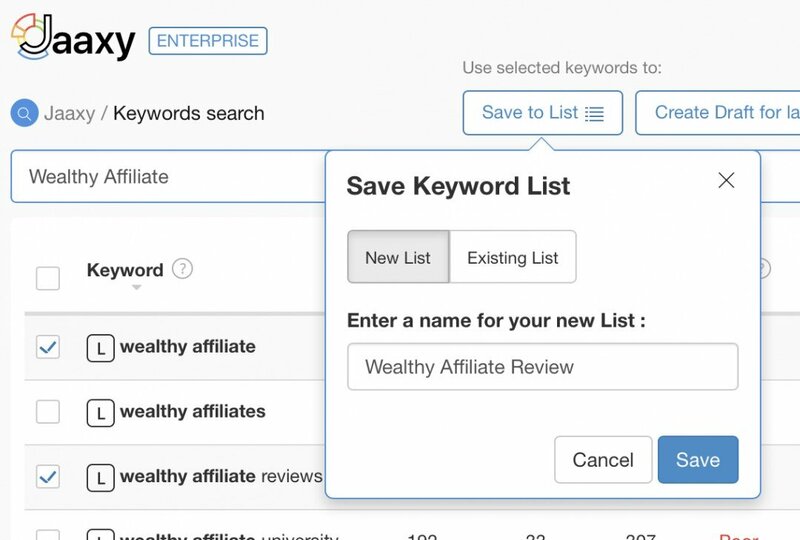 With Jaaxy KW Lists you can add/edit/delete keywords to lists. You can view your lists, export them, and even send those keywords directly to SiteContent to start writing them. Step 1 - Just do a keyword search by entering your phrase into the search box at the top of the tool. 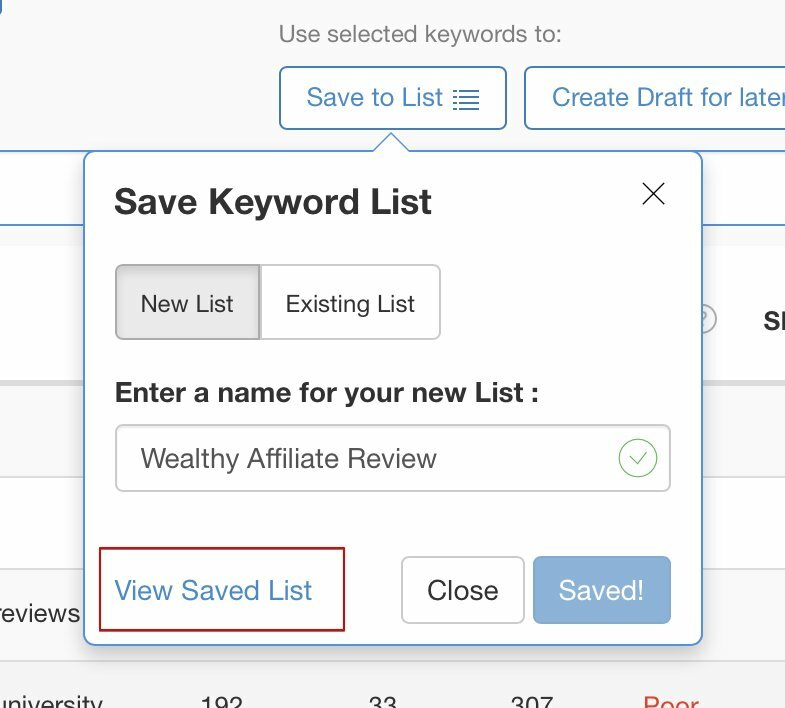 Step 2 - When you find some keywords that you want to put into a KW lists, just check the keywords you want to add to the list and click the "Save to List" button that appears at the top. Choose to create a "New List" or "Existing List" and click "Save". Step 4: View your list! 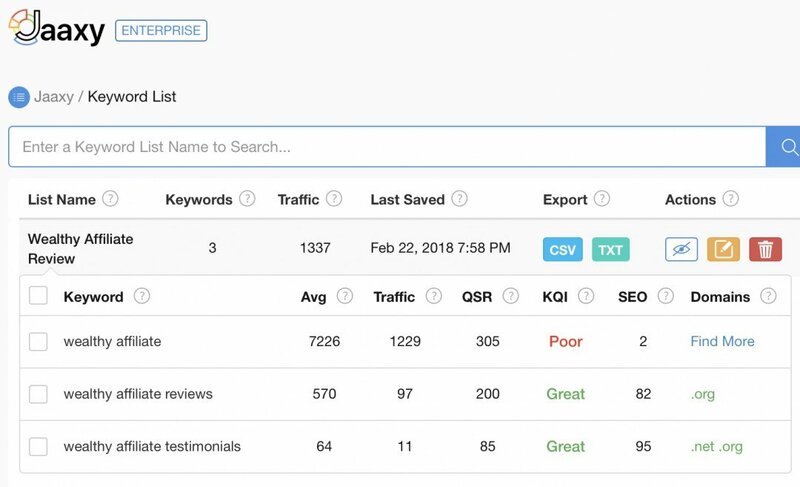 Another new feature that was recently added to both the Keyword Results, and now included in KW Lists is that you can select keywords and choose to create SiteContent with those keyword. 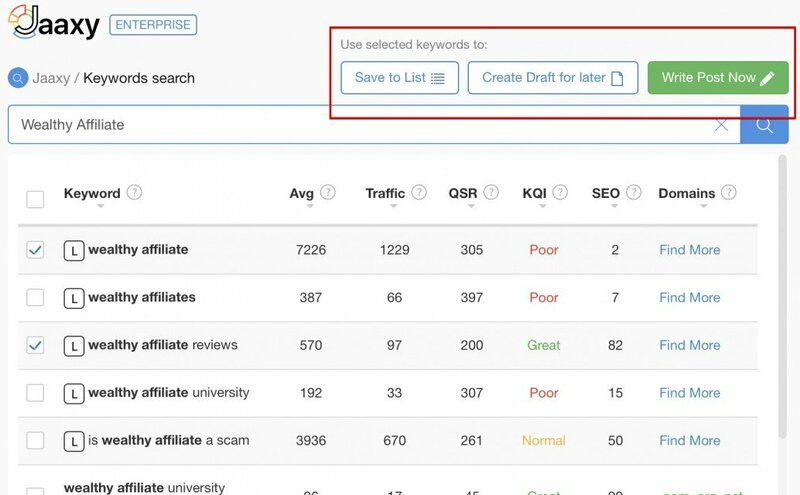 Anytime you select a keyword from the search (or KW Lists), you will see some buttons at the top next to the "Save to List" button that read "Create Draft for later" or "Write Post Now". Write Post Now: This will create a SiteContent draft article and include your keywords in the body of the editor so that you can start writing the article while focusing on these keywords. Create Draft for Later: Want to do a bunch of research and create a number of Article drafts with keywords for later? No problem, just choose the "Create Draft for later" button. You can browse to SiteContent at anytime and you'll see you Drafts right on your article dashboard all set for you to write some keyword targeted content for your site! Auto-Connect For All New Starter Members! When we first integrated Jaaxy into WA, we required folks to connect their accounts and this has worked near flawlessly. However, we are always about simplifying things and we've updated the connection process for NEW members to WA so that upon creating an account at WA, Starters can now start using Jaaxy right away without having to worry about choosing a package. This is pretty exciting because every single member is now connected and ready to do keyword research immediately upon joining WA. For those of you who have been with WA prior to this release you can connect your Pro or Enterprise accounts at anytime, or upgrade from a FREE to LITE account (if you are Premium at WA). Clicking on the "Upgrade Options" button at the bottom of the new Jaaxy menu here inside WA will take you to the connection page. In the past week we removed the link to the "WA Keyword Tool" from the main menu. We let everyone know about this in my last blog post but I wanted to bring it up again that the tool is now something we are completely phasing out as all of the functionality, plus a lot more is available in Jaaxy. There have been a few folks mention that they have keyword lists saved in the WA keyword tool, so we've kept the link LIVE so that anyone who needs to gather their KW lists can do so in the coming weeks. We suggest that you copy these keywords as we will only be keeping this link available for a few more weeks. We are truly just getting started with the integration of Jaaxy into WA and we cannot wait to release the next set of updates that we're already working on. This is hot off the press as I saw a need for people to know how to Export their Keyword Lists and so I created the training for it just now, and here it is! How To Export Keyword Lists From Expiring Keyword Tool Hope this helps those who need an answer soon! Just done a search on Jaaxy Lite for keyword "best home security systems" and got a QSR 183. Did a comparitive search in Google and got 93 results. I have checked other keywords and found similar results, ie "wireless home security systems" Jaaxy QSR 149 and Google 97 results. And yes I am using speechmarks which I understand should give an exact match. And yes I am scrolling to the last page in Google. 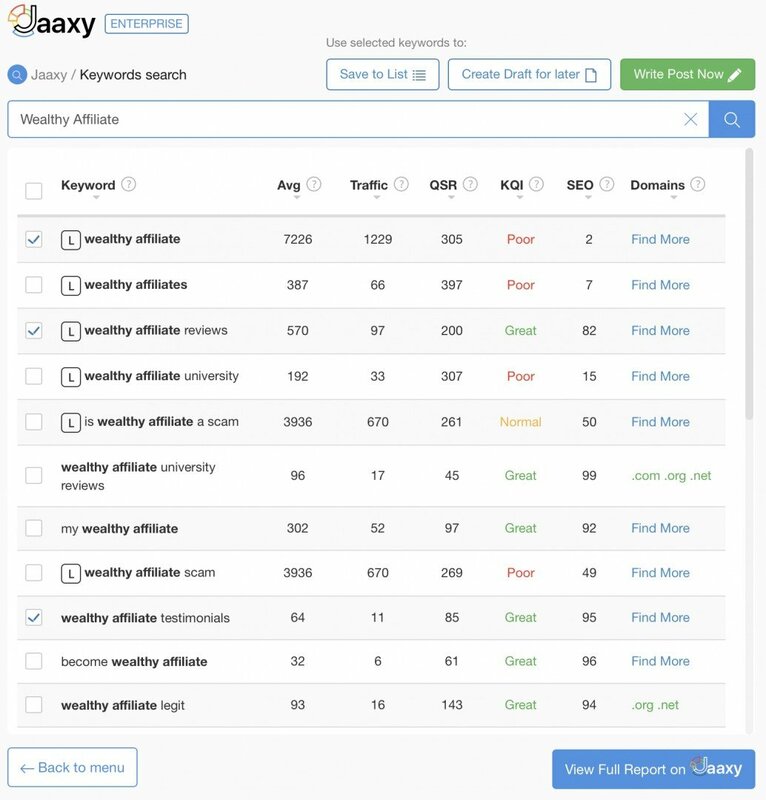 Is there something I've missed?The integrity of Jaaxy is a key element when doing keyword research so when you get results like this you begin the wonder. Anyone else found this issue? I have a small issue with Jaaxy. I recently thought I'd found an undiscovered gem in the keyword "what is a keyword research tool"
Monthly traffic 1253, Est traffic 214, QSR 38, SEO power 89. During my research for the third post I tested free versions of as many tools as I could, and found that the Jaaxy results weren't confirmed by any other tool. eg. Moz monthly traffic for the above example <10, a couple of others around 30. Why is there such discrepancy? I've repeated the tests with various keyword examples and found Jaaxy results always miles away from anyone else's. Sometimes less, sometimes more. How can I be sure who to believe? I asked Kyle the same questions but got no answer. I tried to send you a PM on this but the system doesn't seem to want to let me. Just done a search on Jaaxy Lite for keyword "best home security systems" and got a QSR 183. Did a comparitive search in Google and got 93 results. I have checked other keywords and found similar results, ie "wireless home security systems" Jaaxy QSR 149 and Google 97 results. And yes I am using speechmarks which I understand should give an exact match. And yes I am scrolling to the last page in Google. Is there something I've missed?The integrity of Jaaxy is a key element when doing keyword research so when you get results like this you begin to wonder. Anyone else found this issue? This is a terrific Update man! How on earth should a community as WA be this much opportune? Hey man, this is a HEAVEN out of Hell keyword searches. Give us more manna for a MASSIVE affiliate marketing success. Keep rocking Wealthy Affiliate all over the world. Thanks for all your loving support. You are right there is no comparison for the effort Carson and Kyle and the WA Team behind the scenes put into making this most evolving and ever-improving platform online! Absolutely true. Making all of us move towards a position of service and progress. The cool part is NO SCAMMERS Zone. We have everything we need. On top, the quality is continuously improved. Every year, there is something new. Just ahead in the internet business. Thank you Carson. I am just learning the power of Jaxxy. It takes a while to feel comfortable but wow it is great asset to have. I appreciate the work and dedication you and Kyle have to make sure we succeed. WA is the BEST place I could be. Thank you. ALWAYS something stupendous and outright amazing from you, Carson! I love love love the feature of being able to jump directly into writing a post. Talk about time saver and efficiency! WOW. Never ceases to amaze me the fantastic value that you continue to make a part of the WA program. I am so glad I found you all and grateful that even during my 'stall' while handling a family legal matter I have not let go of my membership and site. Thanks for the updates Carson; I have been able to make more sence of Jaaxy with my screen reader lately, although I still love the simplicity of the old tool, but, I trust the improvements will also favor this blind bat (LOL)! As a side note, the SiteContent platform is still quite unfriendly to me. Blessings! Thank you, Carson. I am intrigued by the upcoming changes. I just want to make sure that I understood this right: when a new member upgrades to Premium, his/her Jaaxy account needs to be manually upgraded from FREE to LITE. It doesn't happen automatically - at least, not yet, does it? Oh, okay. That's awesome! Thank you for clarifying. "2018 is absolutely going to be the year of our biggest advances yet at Wealthy Affiliate. I do not like to to foreshadow too much, but you can expect to be blown away in the coming months as we prepare for one of our biggest releases ever..."
Cant wait for these updates. Lots in the works Minhaj - some HUGE projects!! This is such great news! It's so good that Jaaxy is fully integrated with WA now. It's a great improvement that Jaaxy is connected with SiteContent, we can work so much more efficiently. I'm immensely grateful for your neverending efforts making WA even better and better. Can't wait for the next awwwesome release you are planning to do. Makes me incredibly curious! Carson, wow this update is so not expected. It is more seamless and easier to use WA and jaaxy in future. And I can start to write article straightaway when quality keywords are selected for my niche. It would certainly brings effectiveness in expounding keywords require for the niche we built. Carson thank you for bringing it home with the updates on Jaaxy. Such a cool tool. I am using it almost daily, and find that this system is very easy to use and effective. You and Kyle really deserves more than a hand shake! Awesome! Love that Jaaxy is easier to use inside WA. It’ll be great for work flow. Do you think some people might get confusednby the “Keyword Lists” that are currently on the WA sidebar navigation? I think they might build a list in Jaaxy then try to access their list through that link! Wow! I wrote about Jaaxy 11 hours ago. The Delectable Jaaxy Enterprise - The competitive keyword tool floodgates are open! I didn't know this was coming! Instinct! Lol! I saw the dashboard changes too. Jaaxy has been a game changer for me and I now realize that with all these updates it will continue to be so!. I look forward to writing content now and I like searching for those keywords. These are things I dreaded before. This just adds to the excitement for me! That's awesome Danielle, crazy intuition!!! Great to hear that you're loving Jaaxy and finding it a game changer, I couldn't agree more. Crazy intuition, you can say that again. I think this means that I am really on my way this year! I love using Jaaxy even thou I’m still learning . Wealthy affiliate layout out everything in details step by step. This is the best put together website I ever used. Thanks, Kyle and your team for putting all these tools together for us. I'm very pleased. I'm so excited to be apart of this growing affiliate business. I'm new to this website but I have big goals and I'm looking forward an achieving them. 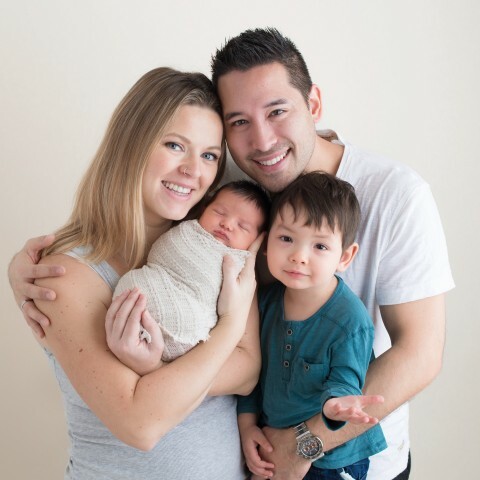 You and your family looking great. What a nice integrated new Jaxxy look! This makes it even more helpful after searching for keywords as it directs to writing a post or creating a draft to use for later! Well done! Thanks so much for the update Carson! Can't wait for the next upcoming biggest advances here at WA! Best platform ever! Earlier this week I copied and pasted a set of keyword phrases into several blank new Site Content articles. That did not take long to do, but now the process will be as quick and easy as a click of a mouse. Very nice. Awesome! I have not fully learned to use all the features in Jaaxy, especially the affiliate program feature. However, I love using Jaaxy even with the little knowledge that I have learned about it. I know I will learn to use its full function soon.